Welcome, Astronomical Society of the Pacific! 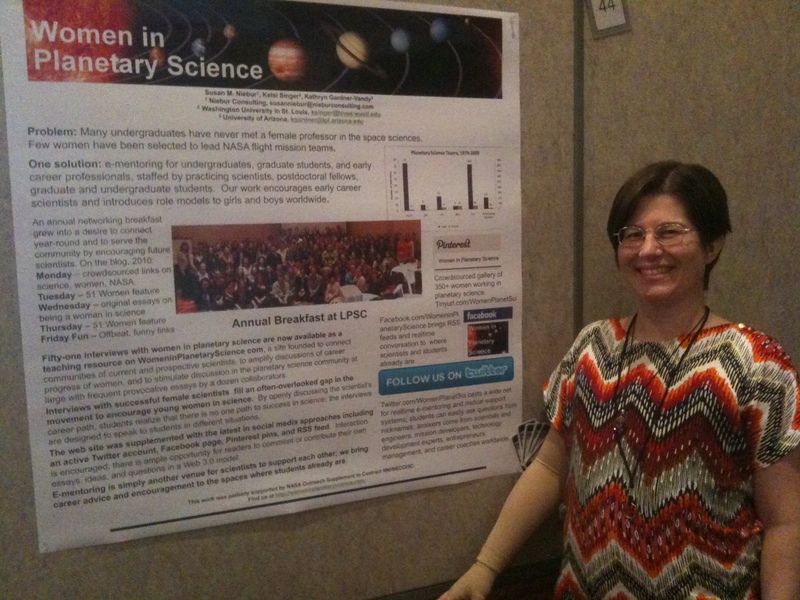 On Monday, I presented a poster on the resources and opportunities available here at Women in Planetary Science to the annual meeting of the Astronomical Society of the Pacific. Unfortunately, I was too ill to stay and talk to people about the poster (I was in the hospital last week, when they found a significant recurrence of cancer in my spine, neck, ribs, and hips, and I’m now undergoing chemotherapy again), but I invited all to visit us here at WomeninPlanetaryScience.com. Archives, sorted by category and labeled “hot topics” to the right. Thank you for visiting – please feel free to leave a comment or ask a question in the section below! ← Why didn’t they cover this in school? that may be promising. They claim: The vision of the National Girls Collaborative Project (NGCP) is to bring together organizations that are committed to informing and encouraging girls to pursue careers in science, technology, engineering, and mathematics (STEM). AAUW’s partners in the project include the EdLab Group; Assessing Women and Men in Engineering; and the Education Development Center. At my daughter’s K-8 school (a Catholic school at the southern end of “northern Virginia”, where it seems to me that the vast majority of mother’s are work-at-home), I volunteer at the once-per-week, after school, 6th grade science club. And my experience after 5 years of doing this is that that club is at least 50% girls, maybe more. I have been pleased and a little surprised, given what we hear about STEM in general and girls in science in particular. My daughter (rising 5th) had a similar experience at both “Nature Camp” – a week of sleep away camp sponsored by the National Zoo – and “Engineering Camp” – both a week in the summer (this and last) and Saturdays for a month lego robotics. Lots of girls. So what is it about your girls versus my girls? Father’s in more technical jobs who are “gender blind” and engage their daughters? Girls who are just keener to do things in general? More disposable income here, so people are more willing to take a chance on things that might not be liked? Did your girls take other summer camps? Or did they not do anything at all? Do you have a daisies/brownies/girl scouts pack associated with the school? Are they getting science in school in the early grades? Our school teaches science well, I think, even in the early grades. And it is made to be fun/interesting. I remember them hatching chicken eggs in first grade, building roller coasters in third, I talked to them about the planets in fourth. I don’t know it is the mothers, necessarily, you need to bring on board. They may be afraid of science themselves. If you have the time and interest, I would encourage you to go in and talk to the science classes at school, work with the brownie mom to work on a science badge (they still do badges, don’t they? ), talk to the school about doing something for Earth Day, volunteer to judge science fair – you only get a chance to talk to the kids you are grading, but that is a real scientist talking to them. Check out the National Science Teacher’s Association site for ideas. question – I know this is not the right place, please maybe direct me to a more appropriate place? This summer, at my daughter’s progressive excellent etc etc summer camp at her progressive excellent school – she was the only girl signed up for science camp. I signed her up without asking her, and she loved it, but I don’t know how to reach out to the other mothers. Because, my daughter is only in first grade – but it starts now, I think, the “it’s not for girls” and “girls aren’t interested” and all the rest… and I am here looking for ways to bring the other mothers on board. Ideas from folks here? Ideas of where I should go?